Strapping machines dispenses, tightens and seals straps (PP or PET) while packing or bundles. It is ideal for cartons, calcium-plastic cases, books, soft and hard packages as well as all kinds of articles in square, cylinder or annulations. 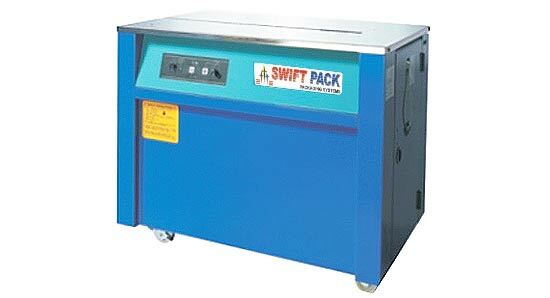 Semiautomatic strapping machine is simple for anyone to use and straps at a quick speed with high efficiency. Simply place your item for strapping onto the table, feed the strap around the item and into the strapping head, which hits a trigger, pulls the strap back in reverse, tensions, and heat seals then cuts the strap. Then it feeds the next piece of strap ready for the next item to be strapped. Automatic strapping machine allows for a hands free strapping operation which improves production speeds and accuracy rates. Simple and easy to operate with the reliability and performance that you require from an automatic strapping machine. Automatic Strapping Machine is suitable for general objects. This machine is equipped with rollers to ensure strapping can be achieved with less force. Automatic strapping machine can be used in production line of which objects differ in size and irregular in shape, and it can achieve unmanned strapping together with power conveyor. Semiautomatic strapping machine Deluxe Model 740 is suitable for cartons, calcium-plastic cases, books, soft and hard packages as well as all kinds of articles in square, cylinder or annulations. The machine with high table is suitable for general objects, while that with table in middle height is suitable for those packages that are larger or heavier. Economical choice for limited strapping usage, bottom seal semi automatic strapping machines now offers you a simple option to apply packaging load securement with low maintenance costs and ease of operation, designed for all general industrial applications. This close-type frame with innovative clutch cams transmission can help you pack/secure your packages firmly and properly. Using polypropylene strap, this banding equipment which owns its aesthetic design and easy-to-operation characteristic is suitable for offices and shops. Manufactured in Taiwan, this semi-auto strapping machines provides you the best packaging experience. Table Top Strapping Machine Model -SP 101is suitable for cartons, calcium-plastic cases, books, soft and hard packages as well as all kinds of articles in square, cylinder or annulations. The machine with high table is suitable for general objects, while that with table in middle height is suitable for those packages that are larger or heavier.